Sally Wingert and Corey DiNardo in Wit. Professor Vivian Bearing has Stage Four – “There’s no Stage Five” – ovarian cancer. A tumor “the size of a grapefruit” has spread to her pelvic bones, to the surrounding organs and the pain, and the pressure of it, combined with the vicious nausea of the chemotherapy, has driven Vivian back to the dreaded hospital where, in Margaret Edson‘s powerful Wit, we stand witness to the final two hours of Vivian’s life. Well, in fact, it is. 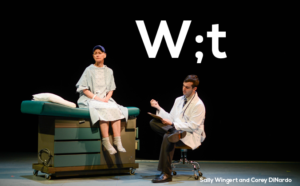 Wit (Artistry Theater, through May 28) goes to the wonderfully contradictory nature of theater. The exuberance and power of an actor at the top of her form, creating a multi-dimensional character, a character in a constant state of giddy metamorphosis easily outweighs the grimness of a mere story. Sally Wingert in Wit is a prime example. Wingert’s Bearing exudes courage and, well, wit. Bearing erects a solid (or so it seems at first) intellectual barrier around her “awesome” cancer via her arch appreciation of the poetry of John Donne. But this defense melts into pure Death-terror. “I’m so scared.” Wingert’s timing is exquisite; just as she begins to frustrate us, our hearts go out to her. Beautiful. Wingert gets plenty of help from Edson and from director Benjamin McGovern. Edson provides plenty of gallows humor, starting at the very top, with Bearing’s light-hearted, “How are you feeling today?” This insouciance continues throughout and makes the play play. And McGovern, in addition to his excellent actor-work, in Wit effectively creates the anarchic atmosphere of a contemporary hospital with its test obsessions: blood panels, urine panels, MRIs, ultrasounds, IV stands, vomit-inducing chemo, swirling beds and exam tables – yikes. Wingert also gets outstanding support from her fellow actors. Christina Florencia Castro, in a truly lovely turn, plays Susie the RN, a color-wearing human being in a sea of faceless blue-clad techs. I was ecstatic every time she walked onstage. Notable also is Barbra Berlovitz as Vivian’s buttoned down boss; Corey DiNardo as Dr. Posner, the medical tech whose sudden “Jesus Christ!” clues us into the severity of Bearing’s disease. Todd Hansen excels as Dr. Kelekian, the aloof attending physician. Wanna prepare for Wit? Dig out your old Norton Anthology and spend 15 or 20 minutes reading some of John Donne’s poetry. Or find the material online. Pay especial attention to the “Death be not proud” sonnet. This research will pay you great dividends.